This roasted pepper sauce has the look and feel of a Mexican salsa but the red peppers in it make it be much less acidic. Even my husband who hates fresh tomatoes and dislikes salsa loved it. It was easy to make though peeling the red peppers was hard. I'm not sure what the point of peeling them is, in particular after having roasted them. In the future I'll leave the skins in. This recipe produces a lot of sauce, probably as much as you'd want for a party for twice as much as you'd require as an appetizer for a dinner - you may want to half it. I served the sauce with Algerian Bouzgene Berber Bread but I think you could serve it with any type of pita bread or even with tortilla chips. Broil the bell peppers and tomatoes until they start to char, about 8 minutes. Let cool and peel tomatoes and bell peppers. Core and seed the bell peppers. Heat the olive oil over medium heat in a small skillet. Add the garlic and jalapeno and sautee until tender. 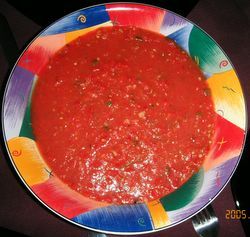 Put the bell peppers, tomatoes, jalapeno and garlic in a food processor or blender and blend until somewhat smooth. Add salt to taste.